This unique Hubble image from early 2009 features Saturn with the rings edge-on and both poles in view, offering a stunning double view of its fluttering auroras. Saturn's auroras are analogous to the more familiar northern and southern light on Earth. At the time when Hubble snapped this picture, Saturn was approaching its equinox so both poles were equally illuminated by the Sun's rays. The northern auroral oval is slightly smaller and more intense than the southern one, implying that Saturn’s magnetic field is not equally distributed across the planet. 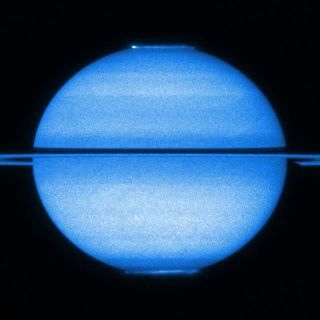 Anew Hubble movie shows a rare view of Saturn with its many rings sitting edge-on,providing a dazzling glimpse of the planet's poles and the auroras that danceabove them. Ittakes Saturn almost thirty years to orbit the sun, with the opportunity toimage both of its poles occurring only twice in that period, when the planetreaches its equinox (the point in a planet's orbit when the sun's rays fallperpendicular to the planet's equator). Saturnhit this position last year, providing Hubble with the unique chance to keep asustained view of the planet with both its poles in view. The movie theycreated from the data, collected over several days during January and March2009, has aided astronomers studying both Saturn?s northern and southernauroras. Giventhe rarity of such an event, this new footage will likely be the last and bestequinox movie that Hubble captures of our planetary neighbor. AsSaturn was approaching its equinox, both poles were equally illuminated by thesun?s rays. Chargedparticles blown out from the sun make their way through the solar system.? Whenthey encounter a planet with a magnetic field, such as Saturn or the Earth, thefield traps the particles, bouncing them back and forth between its two poles. Anatural consequence of the shape of the planet?s magnetic field, a series ofinvisible ?traffic lanes? exist between the two poles along which theelectrically charged particles are confined as they oscillate between thepoles. Themagnetic field is stronger at the poles and the particles tend to concentratethere, where they interact with atoms in the upper layers of the atmosphere,creating auroras,the familiar glow that the inhabitants of the Earth?s polar regions know as thenorthern and southern lights. Atfirst glance the light show of Saturn?s auroras appears symmetric at the twopoles. However, analyzing the new data in greater detail, astronomers havediscovered some subtle differences between the northern and southern auroras,which reveal important information about Saturn?s magnetic field. Thenorthern auroral oval is slightly smaller and more intense than the southernone, implying that Saturn?s magnetic field is not equally distributed acrossthe planet; it is slightly uneven and stronger in the north than the south. Asa result, the electrically charged particles in the north are accelerated tohigher energies as they are fired toward the atmosphere than those in thesouth. This confirms a previous result obtained by the spaceprobe Cassini, in orbit around the ringed planet since 2004.